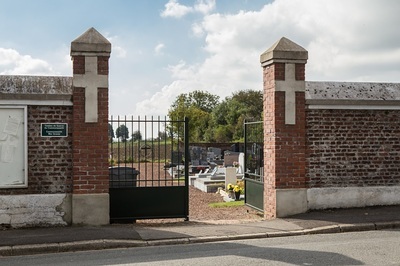 The village of Écurie is approximately 5 kilometres north of Arras and the Communal Cemetery is on the eastern side of the village. 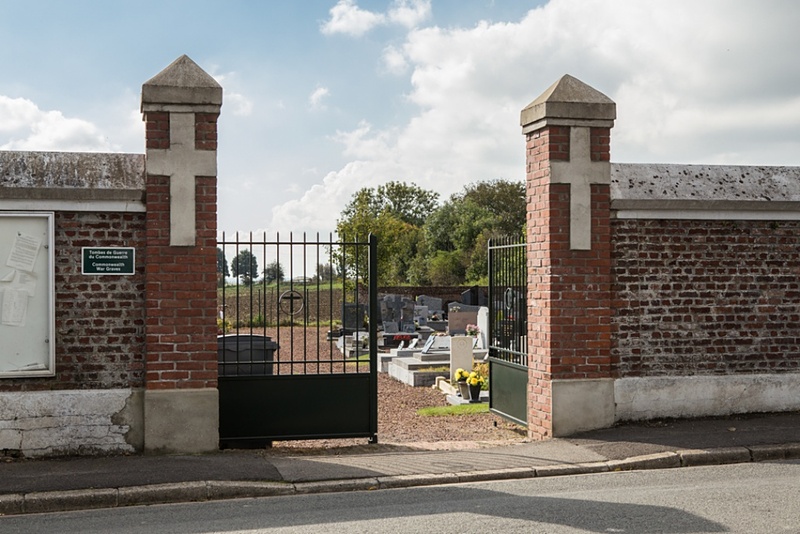 The British graves are on each side of the main path from the entrance to the Calvary at the southern end of the cemetery. 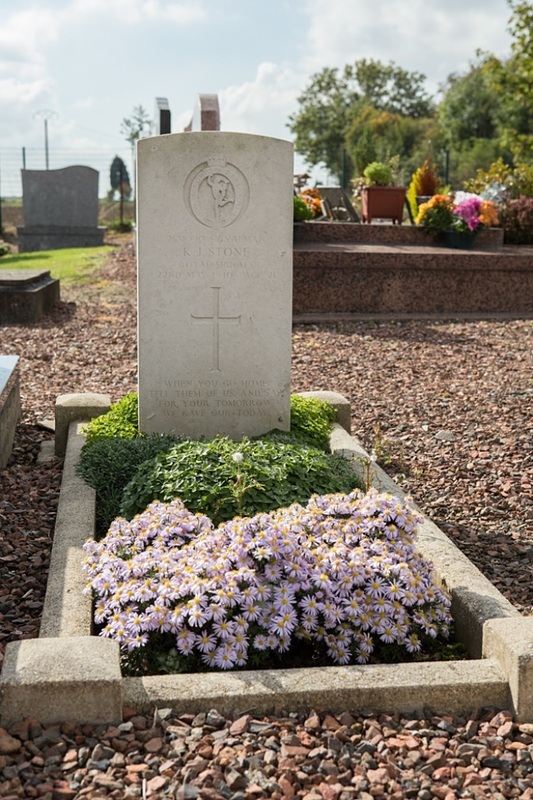 2823406 Private Samuel Wotton Bleakley, 6th Bn. Seaforth Highlanders, died 25th May 1940, aged 21. Son of Matthew and Rebecca Wotton Bleakley, of Paisley, Renfrewshire. INSCRIPTION. WE SHALL MEET HIM AGAIN FOR WE KNOW HE SHALL RISE AGAIN. 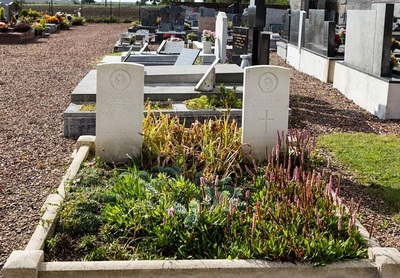 2822594 Private George Douglas McKenzie, 6th Bn. 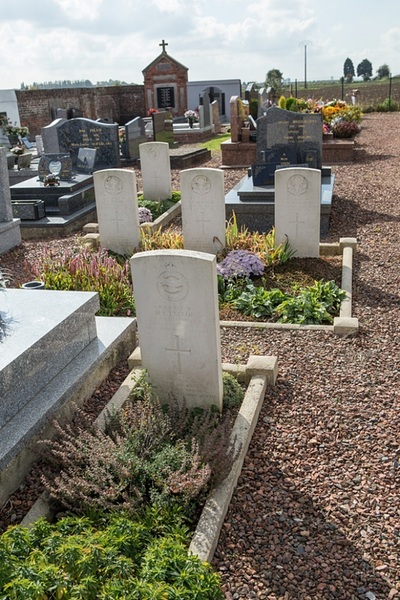 Seaforth Highlanders, died 25th May 1940, aged 20. 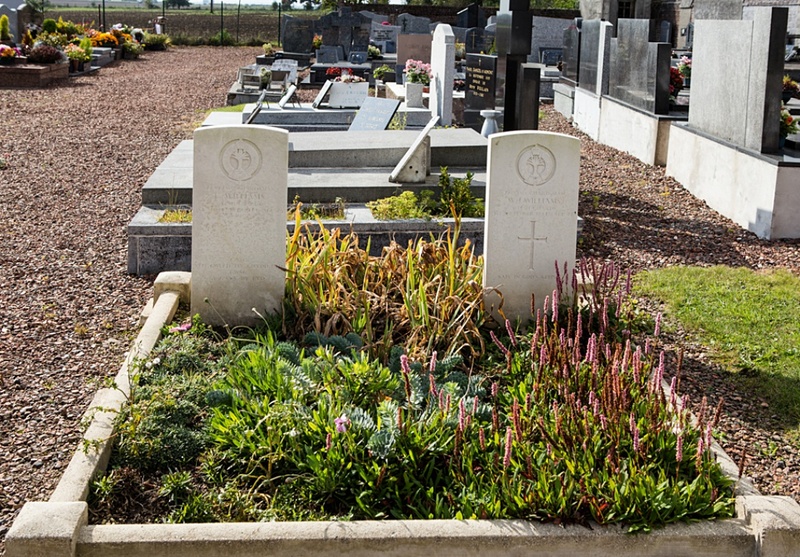 Son of Alexander McKenzie and Margaret Ann McKenzie, of Grantown-on-Spey, Morayshire. INSCRIPTION. HE GAVE TO MIS'RY ALL HE HAD, A TEAR, HE GAIN'D FROM HEAV'N ('TWAS ALL HE WISH'D) A FRIEND". 2581090 Signalman Kenneth John Stone, 5th Division Signals, Royal Corps of Signals, died 22nd May 1940, aged 21. 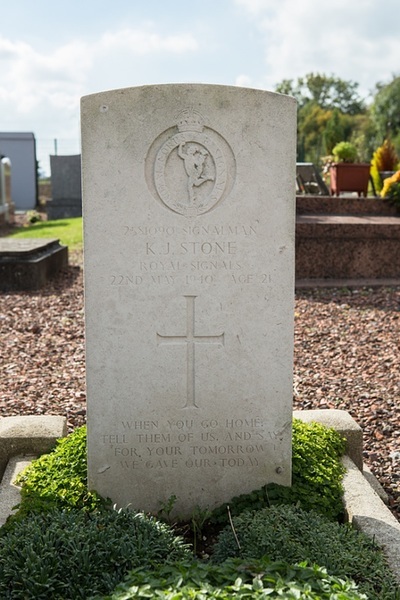 Son of Walter and Annie Elizabeth Stone, of Ely, Cardiff. INSCRIPTION. WHEN YOU GO HOME, TELL THEM OF US, AND SAY, FOR YOUR TOMORROW WE GAVE OUR TODAY. 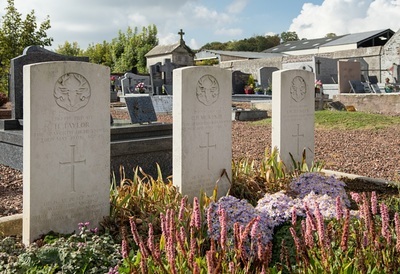 3247448 Private Hugh Taylor, 6th Bn. Seaforth Highlanders, died 23rd May 1940, aged 19. Son of Robert and Bridget Taylor, of Glasgow. INSCRIPTION. HE IS AT PEACE NOW WITH THE ANGELS, WHO ARE OUR OWN PEOPLE WHO HAVE GONE BEFORE. 1616111 Sergeant Maurice John Taylor, Flight Engineer in 427 Squadron, Royal Air Force Volunteer Reserve, died 13th June 1944, aged 20. Son of Benjamin Morris Taylor and Lucy May Taylor, of Wimbush, Essex. INSCRIPTION. AT THE GOING DOWN OF THE SUN AND IN THE MORNING WE WIL REMEMBER THEM. 2735480 Guardsman William Joseph Williams, 2nd Bn. Welsh Guards, died 1st September 1944, aged 27. Son of John and Margaret Williams; husband of Winifred Avis Williams, of Shrewsbury, Shropshire. INSCRIPTION. SAFE IN GOD'S KEEPING. 2734730 Guardsman Gwyn Williams, 2nd Bn. Welsh Guards, died 1st September 1944, aged 25. Son of John and Mary Alice Williams, of Bodorgan, Anglesey. INSCRIPTION. CWSG NES GWELD EIN GILYDD ETO CWSG A GWYN DY FYD"